Pizza – Making it Healthy! I had some friends over for dinner recently – I made pizza – whole wheat flour and semolina crust, topped with lightly sautéed spinach, onions, garlic and tomatoes. I’ve found this very nice reduced-fat (30% fewer calories from fat) mozzarella cheese from SuperMaxi. I’ve got a nonstick pizza pan that is ancient! But it still works, and I don’t feel uncomfortable about eating two slices, knowing that I’ve chosen ingredients that won’t break my calorie bank. 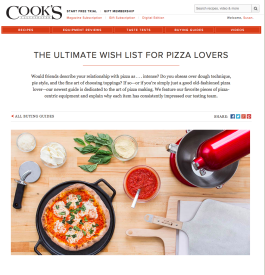 I’ve recently joined the mailing list for America’s Test Kitchen – they review cooking equipment, post recipes and lots of great info about food science. I enjoy Chris Kimble’s weekly podcast – he’s low key, philosophical about food, and his interviews are always interesting – I listen as I’m walking on the Tomebamba river in the morning, or as I’m walking to Spanish class. I recommend it! Depending upon weather conditions and where you live (high humidity, altitude, etc. ), you may need more or less flour, so go slowly. I use a Kitchen Aid Mix-master with a dough hook attachment. I’ve had this model for more than 12 years and it still works perfectly, but any stand mixer with a bread hook will do. By the way, since the dough needs to be kneaded, a blender won’t do. You can also make the dough the old-fashioned way and burn some calories at the same time. Add flour to the yeast mixture slowly, a ½ cup at a time, mixing well with a wooden spoon until dough can be turned out onto a floured (preferably cool) surface. Then, knead for at least 6 minutes (adding remaining flour), until dough is elastic. yeast, add ½ cup of whole wheat flour, stir until incorporated, and wait about 15 minutes, until it gets a bit bubbly. Using the dough hook attachment on slow speed, add bread flour in about ⅓ cup at a time (about 3 cups—or more as needed) and then increase speed and knead until dough comes together and doesn’t stick to the mixer bowl. You should be able to stick your index finger into it and leave a slight impression—it shouldn’t be too sticky to handle. Coat a large bowl with cooking spray, place the ball of dough in the bowl, turn once to coat, then cover with plastic wrap or your bowl’s cover. Let sit for 30 minutes until the dough approximately doubles. Now you’re ready for pizza! Punch down and follow directions for pizza below.This recipe makes enough for two thin-crusted pizzas. You can also refrigerate dough in a large zip-lock bag—just shoot a quick spray of cooking spray inside—for about two days. Before making the topping, “stage” your dough. Roll out or spread in a nonstick pizza pan or rectangular pan that’s been sprayed with cooking spray and cover with a dishtowel—let rise a second time, at least 45 minutes. 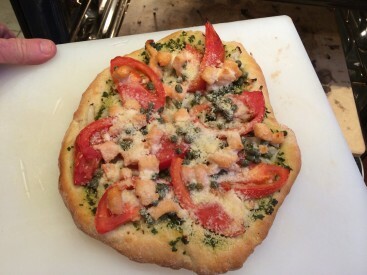 The recipe for dough makes one large pizza…with a thin crust. Do this so the dough has a chance to raise again—it makes the crust good and chewy. mushrooms-sliced, 1 cup—I like Portobello, but any will do! Coat a nonstick sauté pan with a quick spray of cooking oil and heat over low-medium heat. Sauté red pepper flakes over medium heat for 1 minute. Add red onion and garlic; stir and cook for 2 minutes – don’t let garlic burn – it will turn bitter. Add spinach or other greens; cover and cook 3 minutes; uncover, stir, cover, and cook for another minute or so, until wilted. Stir in mushrooms and continue to cook, covered, for about 5 more minutes; uncover and cook for 2 minutes until all liquid is evaporated. Let cool about 10 minutes, and then spread over the dough. Sprinkle on chopped tomato and basil, and then sprinkle on cheese. Bake in the middle of the oven at 455 degrees for about 15 minutes, or until cheese is browned. Tofu, shrimp or sardines: Boost the protein by adding tofu, fresh or frozen shrimp or canned sardines. Use firm tofu, drain and pat dry, and cut into medium dice. For the shrimp, use fresh or frozen small-medium; rinse and drain sardine. Scatter over the pizza before sprinkling on the cheese.